Do You Need A Flatbed To Ship Your Freight? When Do You Need A Flatbed Truck? A flatbed truck to ship freight is necessary when you have over dimensional or very heavy loads to ship. Flatbed trucks are versatile and are used to ship over-sized logs, jet engines or steel construction beams. Even bulky less than truckload freight may require transport by flatbed truck. Flatbed trucks offer easy side loading and unloading of freight. Furthermore, flatbed trucks can be unloaded without the need of a loading dock. Freight shipments can often shift and cause dangerous uneven weight distribution. A flatbed truck offers advantages not found in other trucks. A flatbed allows a freight shipment to be strapped or chained to a flatbed truck’s moorings. These sturdy truck trailers are completely flat, level bodies without side walls or roofing. Although flatbed trucks do not have a roof freight can be tarped to protect from elements of weather and travel. 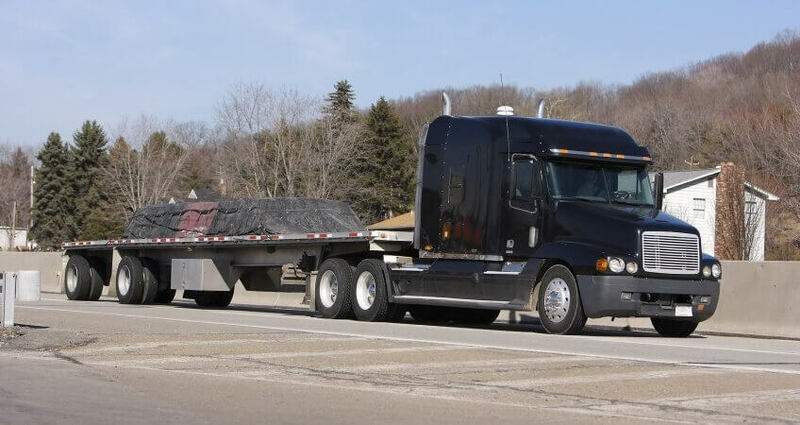 What Are A Flatbed Trucks Dimensions and Limitations? Many times a flatbed truck hauls heavy construction equipment, the load may weigh more than the truck itself. Most flatbed trucks are 48 feet long and 8’6″ width. Although the legal maximum height of freight shipments in most U.S. states is 13′ 6″, shippers must allow cargo space. The weight limitation for freight shipments on a flatbed is usually capped at 48,000 pounds. The total combined weight of truck and cargo must not exceed 80,000 pounds. Otherwise, a special permit must be obtained for overweight loads. When Should A Flatbed Truck Driver Check Their Loaded Cargo? At every truck stop or checkpoint along a transport route, the driver must examine the load moorings carefully. A flatbed truck driver should ensure the cargo is safely secured. Just like any other truck driver, flatbed truck drivers should be well-rested and alert. It is crucial to the safety of the driver and cargo that they remain vigilant at all times. What Are The Different Types Of Flatbed Trucks? Standard Flatbed Truck– These flatbed trucks come in 48 or 53 ft lengths and can haul up to 48000. They are versatile and excellent for ease of loading and unloading. Also, they are great to haul machinery and steel products that are not fragile. Step Deck Trucks– Step-deck trucks can are also 48ft, but are unique because of their 2 deck design. The first deck is 11′ in length and 5′ off the ground. The second deck ( or well ) is 37′ at a height of 36-42″ from the ground. The lower height of the second deck makes them ideal for shipping forklifts. However, a shipper must be able to unload from ground level since the step-deck flatbed truck is not dock height. The max height of the cargo must not exceed 10ft on a step deck trailer. Flatbed trucks continue to be essential vehicles for heavy and oversize freight hauling throughout the U.S. today. Their sturdy, long-lasting construction, and ability to haul heavy-duty equipment or supplies with their open-sided design make them extremely functional for job site deliveries. Contact Freight-Specialist today if you need a flatbed freight shipping quote.